As you would expect from five star luxury, the Dar Al Taqwa Madinah offers 196 deluxe guest rooms and suites, the majority of which have spectacular Al Haram Views. This enviable location allows guests to admire the splendour of the Holy Mosque, and the surrounding marble piazza from the comfort of their own guest room. 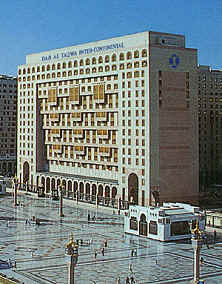 Dar Al Taqwa is centrally located in the heart of Madinah Al Munawara, the second Holy City of Islam. 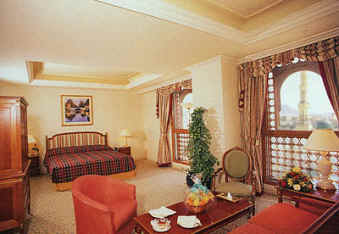 It is a short 15 minute drive from Madinah Airport. Ideally Situated for pilgrims and visitors, the hotel is just footsteps away from the main entrance of the Holy Mosque where lies the Prophet Mohammed-May peace and Blessings be Upon Him. 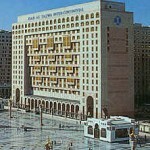 In the hotel’s Al Marwa Restaurant and Coffee Lounge guests may dine on superb International and Arabian cuisine. A tempting buffet is served for breakfast, lunch and dinner and an a` la carte menu is also available. The fully equipped business centre offers secretarial, translation and communication services. Other facilities to complement the luxuriously appointed interior, include a shopping arcade, travel desk and underground parking. Families are equally well-catered for with 24 elegantly furnished, VIP, self-contained suites with one to four bedrooms, a separate dining and living room, kitchen, maid’s room and drivers’ dormitory. 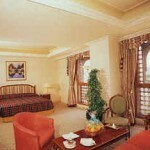 All guest rooms have satellite TV AND 24 hour room service.